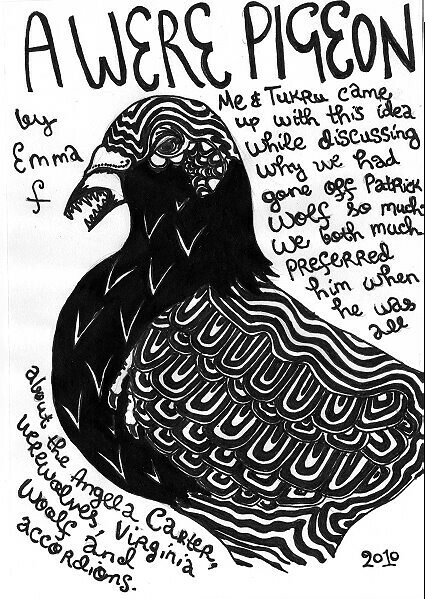 I drew a werepigeon for Tukru . It was a silly private joke, and she insisted I drew it. So I did. I don’t draw much. It’s for a halloween zine she’s putting together, you should make something for it (details here). It’s probably good that I gave her the drawing before it frustrated me so much I threw it in the bin. This is what always happens when I draw stuff. I was all “who is this homerlusk person?”. Then I realised it was you. Check out my LJ for angst. You only get the nice stuff here.